An exotic Andhra-style rich celebration dish with smooth, warm and rich flavors. No onions or tomatoes go into its making, the main player being poppy seeds which lend the dish its body and a subtle sweet flavor. As you bite into the eggplant, you can savor layers of roasted sweet, tangy and savory flavors. A memorable vegetarian delight that will completely floor you. 4 Cover with lid and cook on medium low flame for 5 mts. Keep checking in between and stir fry to ensure it does not stick to the pan. Add the roasted brinjal slices and cook on low to medium flame till the gravy turns thick. It could take approx 25 to 40 mts to turn into a thick gravy. Turn off heat. This dish looks mouth watering. I will def try it. I love cooking and trying new things. it’s been a while that kids zone is updated. Lookin forward for more new dishes. How did u get that thick gravy? I don’t see onions or tomatoes. Only few spoons of powders and tamarind extract. I like to cook in thick consistency that you got. Its the roasted and ground poppy seeds/khus khus which gives the thick gravy to the dish. I am addicted to your blog. There is so much to learn. Will try this one soon. Here we get the huge purple aubergines, if i see the small ones in my next visit to an asian store i am sure gonna buy these and try this dish. Looks so so good that i am really drooling here. its awesome n delicious i want to have whole bowl..
That looks amazing, Sailu! Never had this combi. Have bookmarked. Can I use the big eggplants (the one which we use for baigan bharta) for this curry. The small purple eggplants work best. Having said that you could try with the large ones too. Do leave your feedback if you try with the large eggplants. I tried this curry with a large eggplant. It tasted very good but I did not get the thick curry consistency as yours. I used the same measurements you have mentioned. My guess is that the eggplant quantity was more than the gravy. Will try again as the curry tastes amazing. OMG Sailu, I am drooling..I wish I could just take that katori from the screen. I dont get poppy seeds here, is there anything else I can substitute it with and make this curry ? Your Chat items this summer was a mega hit as I tried loads of them…Could you possibly share some ideas of Meal ideas…it would be really useful if you could suggest the combination of dishes for a complete meal when we invite guests over…Many thanks and please keep blogging as my day doesnt end without having a sneak peek at your website! First time visit to your website.I just wanna dig into that gravy! Am planning to try this dish now.. Hope it turns out to be as good as the chetinnad chicken which is a fav in the house :).. By the way, you mentioned jaggery twice with two different measurements.. Is that a repeat or did you type in jaggery instead of another ingredient? Have updated the recipe. Thanks for pointing out, Tina. very good recipe.I am going to try it. Hello Ms.Sailu, mee vantalu chala baguntayi. pachi venna (pala meegada chilikithe vache plain fresh venna) ela cheyalo cheppagalara? US lo dorike palatho meegada kattatam ledu. maa abbaiki nalugu lo venna kalipithe skin chala chakkaga untundi. ikkada alanti product edanna meeku teliste cheppandi. It looks awesome. I visit this blog whenever I want to try something new. I think you are a big fan of “Vankaya”. “Sorakaya” recipes are very few in this blog. Adding more “Sorakaya” recipes would definitely help “sorakaya” lovers like me. Fresh poppy seeds when roasted have a wonderful aroma and taste good too unlike old stock poppy seeds. Buy fresh poppy seeds and try this recipe. You should not have any problem. Do you use white poppy seeds, or the dark ones? Thanks for your mouth-watering blog. Use white poppy seeds. I usually eyeball the ingredients. For 2 large aubergines, I’d suggest you use 2 1/2 tbsps of fresh tamarind paste. I am not sure about store bought tamarind paste so I really can’t give you exact measurements. What you could do is, while the tamarind-poppy seeds-jaggery base is cooking, taste the liquid. Adjust the ingredients according to your taste. Add more tamarind for a tangier flavor. For 2 large aubergines, use about 4 1/2 tbsps of poppy seeds, 2 1/2 to 3 tbsps tamarind paste and at least 2 1/2 to 3 tbsps of jaggery or sugar. Use about 4 to 4 1/2 cups of water. Alternately, you can grill the aubergines in the oven till soft. We are not looking for a crisp and golden browne aubergine slice. It just has to turn soft with a light brown tinge. appropriate – would you multiply up all the spices too? the flavour is as good. Thanks for your very helpful response! Your most welcome! For spices: Use 1 tsp mustard seeds, 1 tsp cumin seeds, 1 tbsp ginger garlic paste, 1 tbsp coriander pwd, 1 tbsp red chilli pwd,1/2 tsp cumin pwd and 1/2 tsp roasted methi pwd. Fascinating… some things multiplied by 2 and others by 3 e.g. double cumin but triple coriander. Is there a rule of thumb here, or are these amounts just from your experience with this particular recipe? As lover of indian food who has learned everything from books only, I find this kind of thing fascinating, and this is really useful to me, thanks. Its basically from experience and not a rule of thumb. You need not double/triple the seasoning ingredients as much as you would the spice powders. If you doubled a recipe, you would increase the amount of salt and chili powder accordingly, similarly with spice powders. how to grind small amount of poppy seed ,any suggestion ? I use a small blender jar to grind small amounts of masala/paste. Soak the roasted poppy seeds in little water and grind to a fine paste. I have Kenstar mixie but to grind poppy seeds in the smallest jar is challenging. can you say what small blender jar is? I use Sumeet small blender jar and it works fine. I tried this recipe. WOW!!!!! It came out so well. Had with rice and paapad. It tasted so yummy…. I would add a small twist to this recipe.Chop an onion and carmelize it and grind it to paste and add to the gravy. It gives a nice body to it. Again SAILU thank you for all those wonderful recipes and suggestions. What an innovative recipe with eggplants…I mostly do bhartha or baingan-aalu, but this looks so delicious..thanks Sailu!! I have to make it this weekend. 🙁 it does not look like 1.5 TSP of oil though. Well, poppy seeds like sesame seeds when cooked in the gravy yield oil so while cooking add less oil than required. I tried this recipe last night. I didn’t realize white poppy seeds existed, so I made mine with the darker, bluish-grey ones that are normally in lemon poppy seed cake. My gravy came out a very unappetizing dark purple color. It still tasted good, but next time I will find white poppy seeds! Hope you and Nehal are well. A question on poppy seeds. Sometimes recipes say – soak poppy seeds in water and grind to paste. Yes, its difficult to grind few tsps of poppy seeds. Yes, you can dry roast poppy seeds and make a fine powder. That’s absolutely fine. Belated b’day wishes to your son. 🙂 Nehal turned 8 in August. The picture is downright mouth watering!!!!. And i am not really brinjal lover. Iwas wondering if there is a substitute vegetable for this dish. I would really love to try this as soon as possible. The site is amazing. I have a question. I do not like brinjals. Is there any other vegetable I can use? Dry roast khus khus till lightly brown. Maybe you can increase the quantity of khus khus the next time you prepare. woooowww! i wanna make this today…but have only one big brinjal…can i use that and still get the same results? Yes, you can make with one large brinjal. sailu i tried the curry it was really gud,but the look of urs was really mouth watering,thanks for the recepie. Sailuji, Poppy seeds are banned in the UAE. Is there any other substitute? This recipe should be tried only with poppy seeds. But you can substitute with magaz (melon seeds). can you tell me the count of brinjals plss..? You can use about 12 small brinjals for 4 medium size ones. Hi, is tamarind paste a must. Is it ok to cook wihtout tamarind? Tamarind is an integral part of the recipe. But you can try it without tamarind too. I fail to understand why you didn’t get the same texture as reflected in the image above. If you followed the recipe to the T, you should be able to. Maybe you should cook the curry for a longer period allowing it to thicken and then add the brinjals. You need to freeze it in the freezer compartment of the fridge. It should stay good for a week atleast. You have to use white poppy seeds and not the dark ones. Looks like its copied from your site without credit. This blog is awesomee …!! with such a delicious recipes!!! All your recps are great… Looking at the picture i tried this yesterday .. But did not turned out as the picture. or anywhere close..to it.. Are we missing any ingredients in the recp??? I agree…Sailu are we missing any ingredient? The trick is to add more of oil, coriander powder and tamarind paste (of course in the right proportion) which renders that rich gravy look. 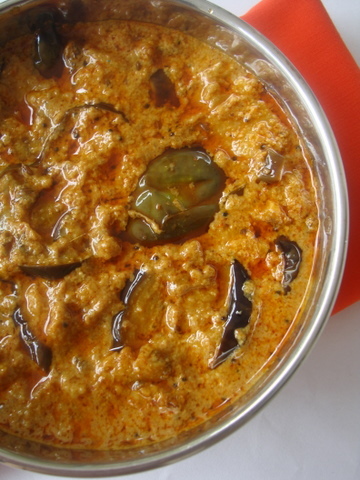 This recipe comes somewhat close to the vankaya pulusu(Andhra) or brinjal kuzhambu(Tamilnadu). So its my suggestion to try this. Tried this tonight for dinner. Skipped the initial eggplant roasting step. Tossed and roasted the eggplant along with rest of the spices. Came out awesome. Initially the gravy was watery, but slow cooking helped to bring the final gravy to the right consistency. Mine looked almost identical to the picture. What is the alternative for poppy seeds? You can use Magaz aka melon seeds. The picture is for a recipe called Baingan Bharta. Maybe some onion would give it a better texture to those who are finding the curry too watery? Good recipe, Very well presented. Thanks! There is no way the gravy would be that oily and oozing oil like that with 1 1/2 tbsp of oil for the entire recipe. I see this over and over again with most of the recipes here. I am not trying to be mean, just pointing out the obvious. I follow the recipes with so much enthusiasm and later on realize how it looks nothing like in the pictures because the proportions are all different. I appreciate your honest opinion regarding your experience with the recipes posted here. In this particular recipe, it is the ground poppy seeds (it is an oilseed) which imparts that oily appearence to the dish. Curry leaves are optional. I have not used dry red chilies. what is khus khus/gasagasalu and poppy seeds is this three are same or different please tell me i like this dish and i want to make it but i cant understand this three please reply me mam………. White poppy seeds is called gasagaslu in Telugu and khus khus in Hindi. khus khus/gasagasalu/poppy seeds one of these or all. Pl help. White poppy seeds is called khus khus in Hindi and gasagasalu in Telugu. you are not answering most of our queries? They look so good and tempting.. must try this new way of making it with poppy seeds..Need to buy some poppy seeds. This recipe is looking very nice, I would love to try. 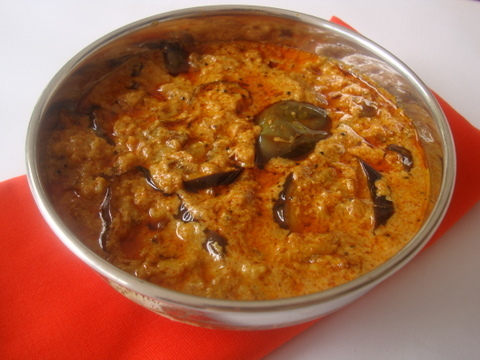 hi sailu this brinjal recipe is totally different from the ones i used to cook. very rich and authentic. thanks for sharing. this is going to be a treat for the kids. Hello, The recepie looks great. Im finding difficult in grinding poppy seeds into paste. Any tip? I mahself try different ways of cooking food.. And I just love cooking. Almost every dish you implant is awesome. Thank you Sailu. The dish is so inviting , am feeling hungry…. Really to eat good food, one should be good cook and am not …..